We first broke the news that the developer behind Blue Tomato (aka Sonic's Jewels, the Sega Master emulator) was wrapping up work on Purple Cherry. Purple Cherry, in keeping up with generic, non-copyright infringing names, is the re-working on Wario's Jewels (WJ7), a Gameboy Pocket emulator that came out last year but was only homebrew i.e. you had to sideload it to your device. That prevented many of you from using it as you need a developer unlocked device to enjoy that feature. 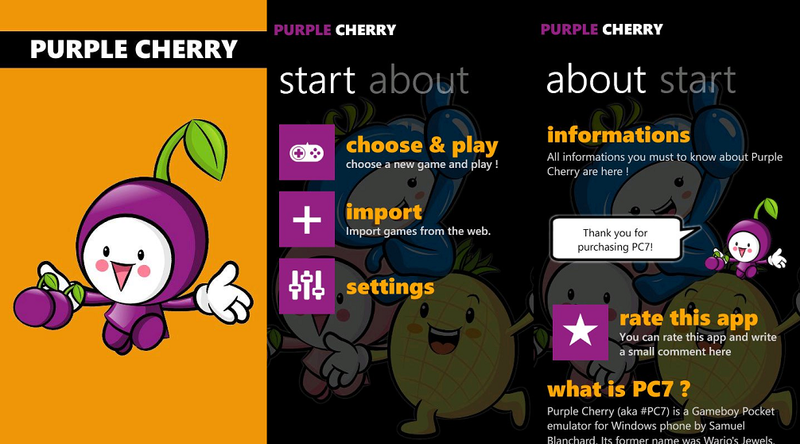 While WJ7 was nice, it also lacked the finesse that Blue Tomato had like Skydrive support and that beautiful new UI. So the developer, BeGood1 Soft, reworked various aspects including improving the core emulator, giving reportedly much better performance during game plays across devices. Overall, this looks to be a killer purchase if you like playing old school games on your phone, so it seems well worth the price of $1.29 should you choose to buy it after using the free trial. Pick it up here in the Marketplace and let us know in comments if you like it or not.